The history of the Bulgarian Cultural Center is like the history of the World – its roots are fading back in the years. Living in different states and cities, far away from home, Bulgarians always keep the fire of the homeland in their hearts. 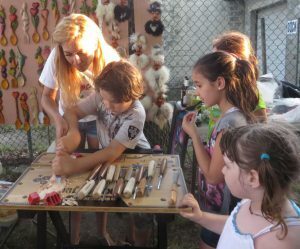 Through the years, small groups have been gathering together – people who love Bulgarian music, poetry, art and crafts. Many folklore ensembles have been created, schools and shops opened. 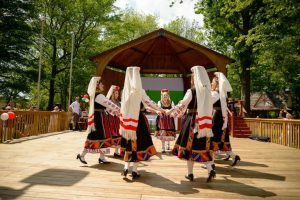 Everything with one purpose – to preserve the Bulgarian culture, language and traditions. Over the last 20 years there have been a variety of online forums and events gathering Bulgarians together, such as “Nashe Selo”, “BG Euforia” and “Bulgarian Film festival”, Philadelphia, presentations of contemporary Bulgarian artists at “Alfa Gallery”, New Jersey and traditional music and dance concerts as well as crafts workshops at Wheaton Arts and Cultural Center, New Jersey. Several concerts were organized in Atlantic City, New Jersey that brought together hundreds of Bulgarians supporting Bulgarian pop and rock music. The Bulgarian stores “Euromarket”, Philadelphia and “Malincho”, New Jersey organized Bulgarian elections as well as other events. 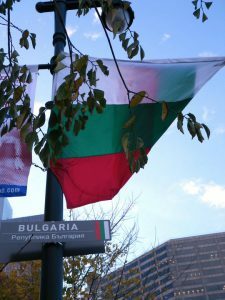 Later on, the first Bulgarian schools in Philadelphia and Allentown area opened their doors for young Bulgarians willing to learn Bulgarian language, history and literature – “Ivan Vazov”, 2007 and “Rodina”, 2009. 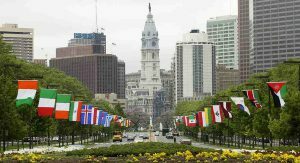 In 2007 Stefan Georgiev started a petition to add the previously absent Bulgarian flag on the Ben Franklin Parkway in Philadelphia – the place where all nations and their cultures meet. After several years of persistent effort, along with the help of Georgi Simeonov, the Bulgarian flag finally waved proudly among all other flags – a recognition that all Bulgarians, not only those in Philadelphia and the USA, but all over the world, highly deserved. The events that lead directly to the formal establishment of the Bulgarian Cultural Center began in 2012 with the wonderful idea of Yoto Yotov. Together with Stefan Georgiev they created a preliminary plan for organizing a celebration for the great Bulgarian Holiday of the Cyrillic Alphabet and Literature in Philadelphia area – a celebration that is traditionally held on May 24 and would bring together Bulgarians from all neighboring states. The idea of Yoto Yotov inspired his family and friends, including Aneliya Yotova, Albena Patroneva and Bojidar Bakalov, Desislava Dimitrova and Svetoslav Dimitrov, Iveta Pirgova, Janush Kacarow, and Sirma Koutzaki, and the planning for the First Bulgarian Festival in the Philadelphia region was underway by February 2013. Soon after, they involved more Bulgarian families and friends to help organizing the event, which took place in May 2013. They called themselves “organizers-enthusiasts” and their number grew to include the names of Martin Atanasov, Dimitar Stoykov, Antoniya Gospodinov, Valeriya Gospodinov, Iliyana Ilieva, Rositsa Draganova-Tacheva, Volen Nikolov, Julia Samuilova, Maria Savova, Toman Slawow, Boryana Stoykova, Boris Urumov, Donka Urumova, Diana Boyanova, Krassimira Lazarova, Nina Stamenova, Rosen Nenchev, Angel Kolev, Genadii Lazarov, Beiti Barbaros, Hristofor Tsochev, and Atanas Tepavicharov. Along the way, many more good Bulgarian people offered their time, energy, and talents. Generous donations were made by kindhearted individuals to help support the celebration of the Bulgarian traditions and culture. 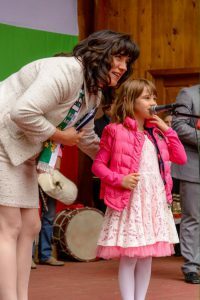 It was decided that the celebration would be called “Bulgarski Sabor (Bulgarian Festival)” because the word “sabor” implies not only the presence of inspiring Bulgarian music and dance, but also honoring of its sacred patrons – in this case St. St. Cyril and Methodius. Numerous performances presented Bulgarian folk music, dance and poetry, including those of the Folk Dance Ensemble Bosilek from New Jersey/New York and the Folklore Group Pesnopoyka from New York; the Folk Dance Group Edelvays from Bulgarian School Rodina and the individual performances of Genadiy Lazarov, Ivaylo Koutchev, Nedyalko Ketev and Todor Enev. Children sang Bulgarian songs and recited poetry, including students from the Bulgarian School Ivan Vazov. The wonderful atmosphere of the festival was further complemented by plentiful traditional Bulgarian food. The program also featured various Bulgarian arts and crafts, including special exhibits of icon paintings by Dochka Ucenova. There were displays of products and services offered by Bulgarian businesses, where people could find some of their favorites. The festival was honored by the Ambassador Extraordinary and Plenipotentiary of the Republic of Bulgaria to the USA, the Consul General of the Republic of Bulgaria in New York, USA, and other notable figures. About 200 to 250 people were expected to attend, yet over 750 people joined in the celebration, and everyone had a terrific time! The Third Annual Festival of 2015 has been the biggest so far. Over 1200 people attended and over 100 were participants in the program, including many folklore ensembles and artists. The attendees once again enjoyed the camaraderie and mutual celebration of culture. Inspired by these festivals a new folk dance group was formed and presented as part of the festival program – Folk Dance Club Rozhen, Philadelphia. Our guests from New York 101 Kaba Gaidi i Tapani, Young Bulgarian Voices Children Choir as well as Gorana Dance Enslemble were featured for the first time at these celebrations to make everyone get up and dance. Dancers from the Dance Group Veselo Horo, New Jersey brought to us the voice of the Bulgarian Community in Atlantic City, New Jersey, while Alfa-BG band reminded us of other genres of the Bulgarian music. There were new visual artists joining the event – Daniela Nesheva, who offered her hand-painted silks and Tanya Angelova, who had hands-on demonstrations on woodcarving for young and old all day long. Photographs from the festivals can be viewed in our web galleries, and videos can be watched on our YouTube channel. After the Second Festival, it was clear that a formal organization was needed to help us better unite the Bulgarian communities in the tri-state region – Pennsylvania, New Jersey and Delaware – and all those who have special interests in Bulgarian culture and traditions. That is why simultaneously with the planning of the Third Annual Festival, we began preparing all documentation for a new non-profit organization. After many sleepless nights, meetings, and heated discussions, we were able to finalize all needed documents, and the new non-profit is now a reality. The name of the organization is “Bulgarian Cultural Center of Pennsylvania, New Jersey and Delaware”. It is lead by dedicated individuals, who worked tirelessly together to realize our dream of a Bulgarian Center and formed its first Board of Trustees. The Board as of now has 5 committees: Programs and Events, Communication, Finance, Board Development and Volunteers, and everyone is welcome to join our work.